The 13th meeting of the Shanghai Cooperation Organization (SCO) National Security Council Secretaries will be held in Beijing on May 21 and 22. At the invitation of State Councilor Zhao Kezhi, Indian Deputy National Security Adviser Rajinder Khanna, Presidential Aide and Secretary of National Security Council of Kazakhstan Nurlan Ermekbaev, Secretary of the National Security Council of Kyrgyzstan Damir Sagynbayev, Advisor to the Prime Minister of Pakistan on National Security Nasser Khan Janjua, Secretary of the National Security Council of Russia Nikolai Patrushev, Secretary of the National Security Council of Tajikistan Abdurahim Kahorov, Secretary of the National Security Council of Uzbekistan Makhmudov Victor Vladimirovich, SCO Secretary-General Rashid Alimov, and Director of the Executive Committee of the SCO Regional Anti-Terrorism Structure Yevgeniy Sysoyev will attend the meeting. The participants will exchange views on the regional security situation and security cooperation priorities of the SCO. Q: The vice foreign minister of the DPRK said that if the US is unilaterally forcing the DPRK to abandon their nuclear program, the DPRK will "reconsider" its summit with the US. Also, the DPRK criticized the recent large-scale joint military exercises held by the ROK and the US, and decided to halt a high-level DPRK-ROK meeting previously scheduled to be held on May 16. What is your comment? A: I have noted these two reports you mentioned. On your first question, the current momentum for dialogue and détente on the Korean Peninsula, which does not come by easily and should be cherished by all, meets the common interests of all parties and represents the shared aspiration of the international community. When the peaceful political settlement of the Korean Peninsula issue is facing important opportunities, all relevant parties, the US and the DPRK in particular, should meet each other halfway, demonstrate goodwill and sincerity to each other, jointly create enabling conditions and atmosphere for their summit, and make positive efforts for the denuclearization and enduring stability of the Korean Peninsula. On your second question, we have seen the announcement by the KCNA as well as some responses of the international community. I want to repeat that the current détente on the Korean Peninsula needs to be cherished by all relevant parties. The political settlement of the Korean Peninsula issue is presented with important opportunities. We hope that both the ROK and the DPRK could follow the spirit of dialogue, reconciliation and cooperation embodied in the Panmunjom Declaration, fully understand and respect each other's legitimate concerns, work in the same direction, accumulate mutual trust, and improve bilateral relations, and they will have our support in these efforts. In order to sustain and consolidate the momentum of the improving situation on the Korean Peninsula, all relevant parties shall demonstrate goodwill to each other, avoid provocative actions that will trigger tension, and make concerted efforts to create enabling conditions and atmosphere for reaching a political settlement to the Korean Peninsula issue through dialogues. Q: What is the main purpose of holding the 13th meeting of the SCO National Security Council Secretaries at this moment? A: This will be the 1st SCO National Security Council Secretaries' meeting after the SCO enlargement. Its primary task is to prepare for the meeting of the SCO Heads of State Council or the Qingdao Summit for short next month, on the political and security fronts. The Chinese leader will have a group meeting with the heads of all the delegations. At the 13th meeting of the SCO National Security Council Secretaries which will be chaired by State Councilor Zhao Kezhi, all participating parties will thoroughly exchange views on the regional security situation, cooperation on combatting the "three forces" of terrorism, separatism and extremism, drugs trafficking and cross-border organized crimes, and international information security. We believe that under the concerted efforts of all parties, this meeting will help build consensus on the security cooperation among the SCO members and inject new vitality into the SCO security cooperation. Q: According to reports, Prime Minister Jacinda Ardern of New Zealand said at the China Business Summit that relationship with China is one of the country's most important and far-reaching international relationships and that China and New Zealand really have led the world in many ways by developing a relationship that brings great benefit to both sides. She added that it will take pioneering spirit and perseverance on both sides to develop such a relationship. What is your comment? A: I have seen relevant reports. China appreciates Prime Minister Jacinda Ardern's positive remarks on deepening China-New Zealand relations. Since the establishment of diplomatic ties, our bilateral relations have achieved remarkable progress. Bilateral practical cooperation has led the world in many ways, and it is obvious that these "firsts" have delivered tangible benefits to our two countries and two peoples. 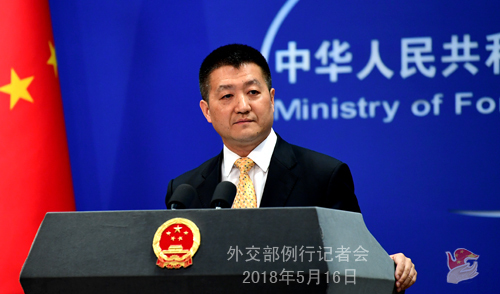 Under the current circumstances, China stands ready to work with New Zealand to deepen political mutual trust, expand dialogue, communication and cooperation in various areas and advance the comprehensive strategic partnership for more positive outcomes, based on the principle of mutual respect, equality and mutual benefit. Q: I have another question on the DPRK. What is China's opinion about these military drills by the ROK and the US? Do you think that they should stop holding these drills to promote peace negotiations? A: China's position on the Korean Peninsula issue is consistent. We maintain that all relevant parties need to take concrete actions to build mutual trust, avoid provoking each other, and endeavor to bring the Korean Peninsula issue back to the track of political settlement through dialogues, all of which will be realized when all parties meet each other halfway. That is also why China has long been advocating the "suspension for suspension" proposal. We believe this proposal will help each other build mutual trust and put in place necessary conditions to resolve the issue through dialogues. As for your specific question, like what I said to the Yonhap News journalist, all parties should cherish the hard-won momentum of détente on the Korean Peninsula, which will be the starting point for efforts to ensure that the high-level meetings and dialogues already on agenda could take place as scheduled and produce real results. That represents the only way to consolidate the improving situation on the Korean Peninsula and promote peace and stability of the region. Q: Yesterday, China and Trinidad and Tobago signed a memorandum of understanding on jointly advancing the Silk Road Economic Belt and the 21st Century Maritime Silk Road. Is this the first cooperation document inked between China and a Caribbean country on the Belt and Road cooperation? A: You are correct. The relevant MoU signed between the governments of China and Trinidad and Tobago yesterday is the first inter-governmental document on jointly advancing the Belt and Road Initiative between China and a Caribbean country. China is willing to integrate the Belt and Road Initiative with the development strategies of Trinidad and Tobago to enhance policy coordination and promote practical cooperation in such areas as infrastructure building, energy, finance and agriculture, under the principle of shared benefits through consultation and contribution and for the interest of our two countries and two peoples. It is obvious that the Latin American and Caribbean countries have also become important participants of the Belt and Road Initiative. Yesterday, Prime Minister Keith Rowley also said that Trinidad and Tobago would like to play an active part in the Initiative to boost the development of relations between Latin America and China, especially between the Caribbean countries and China. 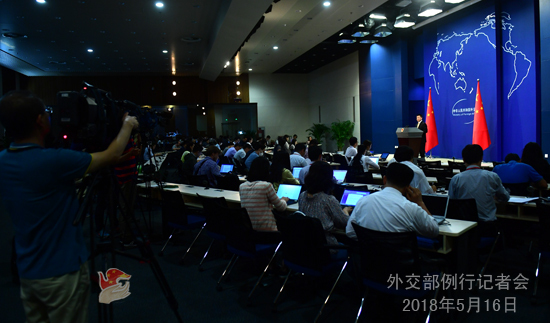 At yesterday's first meeting of the Foreign Affairs Commission of the CPC Central Committee, President Xi Jinping stressed that in recent years, the Belt and Road Initiative, translated from ideas into action, has fledged into substantive international cooperation and made remarkable outcomes. You may all have noticed that there have been more people, countries and international organizations choosing to endorse and participate in the Belt and Road Initiative. For instance, Chairman of the Boao Forum for Asia Ban Ki-moon said the other day that China's Belt and Road Initiative should be leveraged to help Asia achieve better development. Brazilian Foreign Minister Aloysio Nunes who recently paid a visit to China also said that the Brazilian side is actively exploring how to forge synergy between the Initiative and its own development strategies as this is mutually beneficial. Yesterday, China inked a memorandum of understanding with Oman as well on jointly advancing the Belt and Road Initiative. 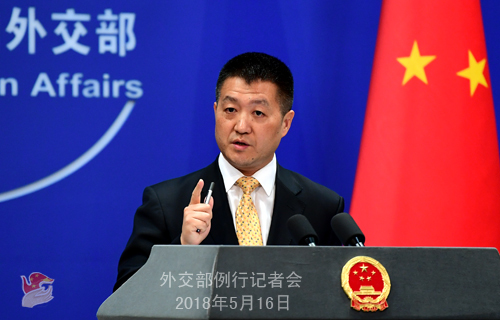 Going forward, China will continue to expand opening-up, enhance communication, consultation and cooperation with other countries, make solid steps to further deepen and steadily move forward cooperation on the Belt and Road Initiative, and ensure that the opportunities and outcomes brought about by this initiative will be shared by all. Q: Recent severe flooding and dam bursts have displaced nearly 300,000 people in many places of Kenya. Will the Chinese side offer assistance to Kenya? A: China expresses condolences to Kenya on the massive displacement caused by severe flooding. President Xi Jinping has sent a message of condolence to Kenyan President Uhuru Kenyatta. According to the China International Development Cooperation Agency, the Chinese government has decided to offer emergency humanitarian assistance to the Kenyan government for disaster relief.